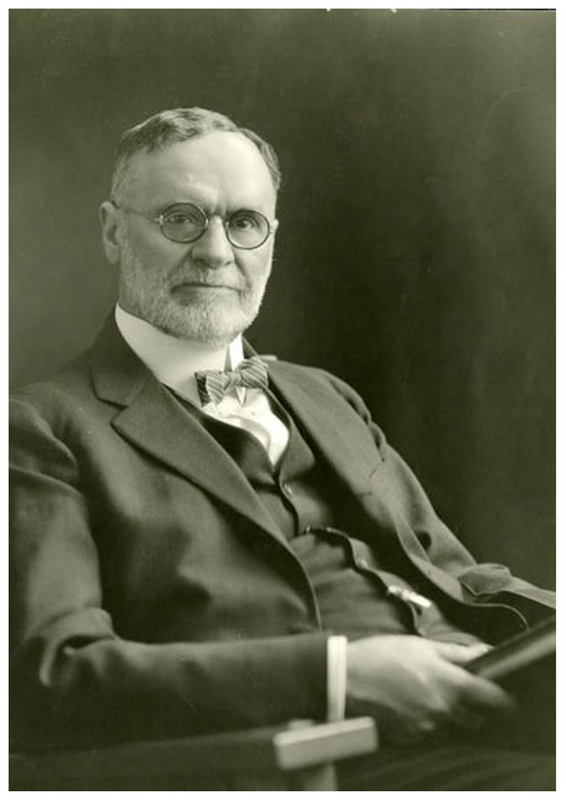 The purpose of this post is to aggregate quotations from Wilford Woodruff's journals with respect to the text of the Book of Abraham and the Egyptian papyri. References that seem clearly outside of the Book of Abraham that seem dependent upon other scripture (such as references to the "God of Abraham, Isaac, and Jacob") are excluded from this compilation. All spelling is as in the original. NOV 25th Took the parting hand with Elder Sherwood. I then set out in company with Elder Smoot on foot in a hard snowstorm for Kirtland. We Came in Sight of the Temple of the Lord before we reached the village & I truly felt to rejoice at the Sight as it was the first time that mine eyes ever beheld the house of the Lord built by Commandment & Revelation. The purpose of this post is to aggregate quotations from early LDS history with respect to the text of the Book of Abraham and the Egyptian papyri, as reported in the Journal of Discourses. Some of the content will be more historical in nature and other quotations use the Book of Abraham for doctrinal purposes; all references are included in this list. The intent here is to provide a comprehensive listing of relevant quotations, however, I make no such guarantees that the objective has been achieved. There are other references to Abraham in the Journal of Discourses that are not included below; these references are believed to have derived from Genesis, rather than from the Book of Abraham. "The Abraham texts gave Joseph another chance to let his followers try translating. While working on the Book of Mormon in 1829, Joseph invited Oliver Cowdery to translate: he tried and failed. Now with the Egyptian papyri before them, Joseph again let the men with the greatest interest in such undertakings--Cowdery, William W. Phelps, Warren Parrish, and Frederick G. Williams--attempt translations. Parrish was told he "shall see much of my ancient records, and shall know of hiden things, and shall be endowed with a knowledge of hiden languages." Through the fall of 1835, the little group made various attempts. "This after noon labored on the Egyptian alphabet, in company with [brothers] O. Cowdery and W.W. Phelps," Joseph's journal notes. They seem to have copied lines of Egyptian from the papyrus and worked out stories to go with the text. Or they wrote down and Egyptian character and attempted various renditions. Joseph apparently had translated the first two chapters of Abraham--through chapter 2, verse 18, in the current edition--and the would-be translators matched up hieroglyphs with some of his English sentences. Their general method can be deduced from a revelation given to Oliver Cowdery after he failed to translate the gold plates: "You must study it out in your mind; then you must ask me if it be right, and if it is right, I will cause that your bosom shall burn within you." One can imagine these men staring at the characters, jotting down ideas that occurred to them, hoping for a burning confirmation. They tried one approach after another. Joseph probably threw in ideas of his own. Eventually they pulled their work together into a collection they called "Grammar & A[l]phabet of the Egyptian Language," written in the hands of Phelps and Parrish. Of all the men working on the papyri, only Joseph produced a coherent text. What was going on as he translated? For many years, Mormons assumed that he sat down with the scrolls, looked at each Egyptian word, and by inspiration understood its meaning in English. He must have been reading from a text, so Mormons thought, much as a conventional translator would do, except the words came by revelation rather than out of his own learning. In 1967, that view of translation suffered a blow when eleven scraps of the Abraham papyri, long since lost and believed to have been burned, were discovered in the Metropolitan Museum of Art in New York City and given to Latter-day Saints leaders in Salt Lake City. Color pictures were soon printed and scholars went to work. The texts were thought to be the Abraham papyri because Joseph had published facsimiles from the papyri with his translation, and the same pictures appeared on the museum fragments. Moreover, some of the characters from the Egyptian grammar appeared on the fragments. The translation of these texts by expert Egyptologists would finally prove or disprove Joseph's claims to miraculous translating powers. Would any of the language correspond to the text in his Book of Abraham? Some Mormons were crushed when the fragments turned out to be rather conventional funerary texts placed with mummified bodies, in this case Hôr, to assure continuing life as an immortal god. According to the Egyptologists, nothing on the fragments resembled Joseph's account of Abraham. 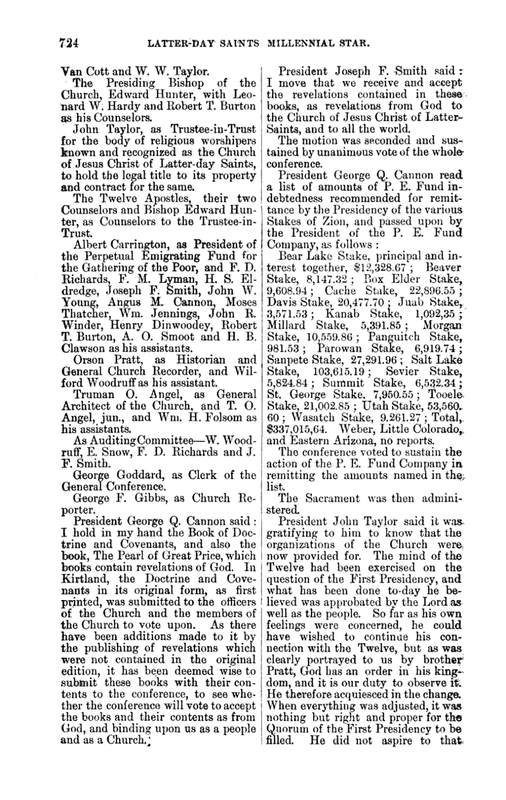 Some Mormon scholars, notably Hugh Nibley, doubt that the actual texts for Abraham and Joseph have been found. The scraps from the Metropolitan Museum do not fit the description Joseph Smith gave of long, beautiful scrolls. At best the remnants are a small fraction of the originals, with no indication of what appears on the lost portions. Nonetheless, the discovery prompted a reassessment of the Book of Abraham. What was going on while Joseph "translated" the papyri and dictated text to a scribe? Obviously, he was not interpreting the hieroglyphics like an ordinary scholar. As Joseph saw it, he was working by inspiration--that had been clear from the beginning. 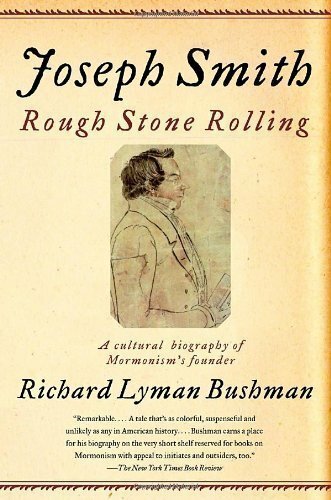 When he "translated" the Book of Mormon, he did not read from the gold plates; he looked into the crystals of the Urim and Thummim or gazed at the seerstone. The words came by inspiration, not by reading the characters on the plates. By analogy, it seemed likely that the papyri had been an occasion for receiving a revelation rather than a word-for-word interpretation of the hieroglyphs as in ordinary translations. Joseph translated Abraham as he had the characters on the gold plates, by knowing the meaning without actually knowing the plates' language. Warren Parish, his clerk, said, "I have set be his side and penned down the translation of the Egyptian Heiroglyphicks as he claimed to receive it by direct inspiration of heaven." When Chandler arrived with the scrolls, Joseph saw the papyri and inspiration struck. Not one to deny God's promptings, the Prophet said what he felt: the papyri were the writings of Abraham and Joseph. the whole thing was miraculous, and to reduce Joseph's translation to some quasi-natural process, some concluded, was folly. The peculiar fact is that the results were not entirely out of line with the huge apocryphal literature on Abraham. His book of Abraham picked up themes found in texts like the Book of Jasher and Flavius Josephus's Antiquities of the Jews. In these extrabiblical stories, Abraham's father worshiped idols, people tried to murder Abraham because of his resistance, and Abraham was learned in astronomy--all features of Joseph Smith's narrative. Josephus says, for example, that Abraham delivered "the science of astronomy" to the Egyptians, as does Joseph's Abraham. The parallels are not exact; the Book of Abraham was not a copy of any of the apocryphal texts. In the Book of Jasher, Abraham destroys the idols of King Nimrod with a hatchet and is thrown into a furnace; Joseph's Abraham offers no violence to the idols and is bound on a bedstead. The similarities are far from complete, but the theme of resisting the king's idolatry and an attempted execution followed by redemption by God are the same. The parallels extend to numerous small details. Joseph may have heard apocryphal stories of Abraham, although the Book of Jasher was not published in English until 1829 and not in the Untied States until 1840. A Bible dictionary published by the American Sunday School Union summed up many of the apocryphal elements. Whether Joseph knew of alternate accounts of Abraham or not, he created an original narrative that echoed apocryphal stories without imitating them. Either by revelation, as his followers believed, or by some instinctive affinity for antiquity, Joseph made his own late--and unlikely--entry in the long tradition of extrabiblical narratives about the great patriarch. Despite his gift for "translating," Joseph wanted to learn language in the ordinary way and translate rationally as well as miraculously. When he returned to the translation of Abraham in 1842, he again proposed an Egyptian grammar. He apparently hoped to transform his inspired interpretation of the text into a mastery of the Egyptian language. In the fall of 1835, when he first began work on the Abraham text, he was also planning to study languages conventionally. Dr. Daniel L.M. Peixotto, a professor of medicine at Willoughby University four miles from Kirtland, was hired to teach Hebrew in the School of the Prophets. When Peixotto could not come, the brethren hired Joshua Seixas, a Jewish convert to Christianity then teaching at the Western Reserve College. In the interim, Joseph studied Hebrew on his own and, after Seixas arrived in January 1836, attended class conscientiously--a prophet learning from a scholar. He proudly recorded Seixas's comment that "we are the most forward of any class he ever taught." Joseph was one of ten to meet for extra sessions with the professor. Seixas called Joseph an "indefatigable" student. Excited by his learning, Joseph resolved "to persue the study of languages untill I shall become master of them, if I am permitted to live long enough." The Hebrew classes continued until the dedication of the temple in March, when Seixas dropped from sight. In light of Joseph's language study, the Egyptian grammar appears as an awkward attempt to blend a scholarly approach to language with inspired translation. Like Abraham, Joseph wanted to be one who "possessed great knowledge." He began his career as a prophet by translating gold plates inscribed in "reformed Egyptian." As late as 1842, he worked on the translation of papyri from an Egyptian tomb. The allure of the ancient comes through in the revelation to Oliver Cowdery about "those ancient records which have been hid up, that are sacred." Beyond the Book of Mormon people, other Israelites had kept records that would flow together in the last days. The sealed portion of the gold plates was yet to be revealed, and revelations to sundry others had generated caches of records, all part of the Lord's work, all to be recovered in time. Translation gave him access to the peoples of antiquity. Full of wonders as it was, the Book of Abraham complicated the problem of regularizing Mormon doctrine. 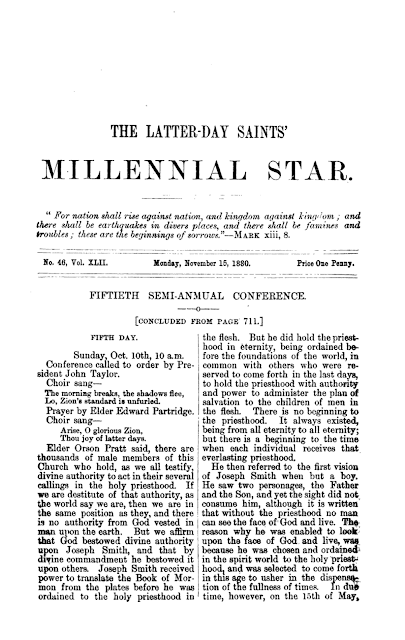 The Doctrine and Covenants was meant to stabilize Mormon beliefs, but in the very year of its publication, the papyri rode into Kirtland in Michael Chandler's wagon, bringing news of Abraham from the tombs of Egypt. Every attempt to regularize belief was diffused by new revelations. Who could tell what would be revealed next--what new insight into the patriarchal past, what stories of Abraham, Moses, or Enoch, what glimpses into heaven? Joseph himself could not predict the course of Mormon doctrine. All he could say he summed up in a later article of faith: "We believe all that God has revealed, all that he does now reveal, and we believe that he will yet reveal many great and important things pertaining to the kingdom of God." 1 W.W. Phelps, "Letter No. 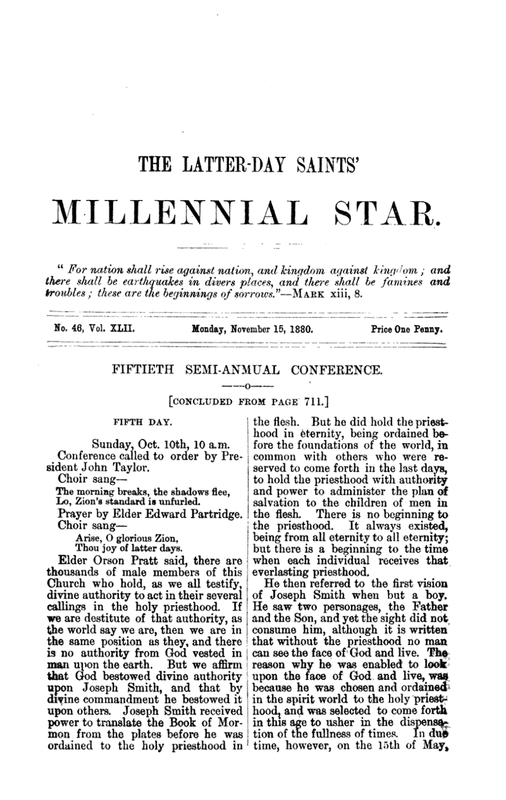 8," June, 1835, Latter Day Saints' Messenger and Advocate 1/9 (June 1835):130; Phelps also wrote, "I am truly glad you have mentioned Michael, the prince, who, I understand, is our great father Adam," which corresponds to temple-related doctrine even before the Kirtland temple was finished, much less the Nauvoo temple. 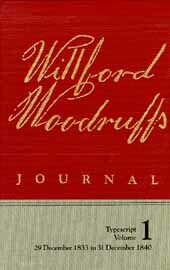 In the August 1942 issue of the Improvement Era, under the title of "Genealogy," the Church published an excerpted transcript from a letter written by W.W. Phelps to his wife Sally in July 1835.1 This letter references the work being done on the papyri, providing some historical insights into the matter. The article also included an image of a letter written by Joseph Smith to Sally, essentially thanking her as W.W. Phelps spent a "short season" with him away from her and the family. Both letters have relevance to the history of the papyri and the Book of Abraham. The images are provided below, as well as a typescript of some of the contents. "Portraiture is by far the most important and productive genre of Egyptian art, just as biography is the most ancient and productive genre of Egyptian literature. Both genres are self-thematizations of an individual subject, one in the medium of art, the other in the medium of language. To be sure, the Egyptian portraits are not self-portraits in our sense of the term, nor are the biographical inscriptions autobiographies in our sense. It is not the self of an artist or writer which is revealed by a statue or speaking in an inscription, but the self of the patron, who had the portrait sculptured or the inscription carved. What matters is the “self” that gives the order, not the one that executes it....We can deal rather with the order-giving, self-thematizing self, which wants to convey these qualities in its iconic self-thematization. No one will deny that self-thematization prevails in the artistic and inscriptional evidence of Ancient Egypt to an extraordinary degree and that both genres of self-thematization account for the singular character of Egyptian culture. For underlying almost every Egyptian inscription and every monument there is such an “order-giving self.” Since, as has rightly and repeatedly been stressed, Egyptian art is always functional and never decorative, it is this notion of self which seems to determine its functional contexts to the greatest extent." Is it possible that the Abrahamic text was ordered by Abraham and inscribed by somebody else? According to Assmann, this would be the norm. Notes: "The Disjunction of Text and Image in Egyptian Art"
While she is primarily referring to literate and illiterate Egyptians, she articulates that, "Nonetheless a complete message was communicated to both audiences." How might this apply to the Joseph Smith Papyri? Is it possible that the vignette (Facsimile 1) could have more than one interpretation based on the accompanying text(s), or literacy of the reader? "In Late Period Books of the Dead, the vignette of a spell is not always correctly aligned with the text..."